“Tier 1 Collaborative Learning Lessons” and Whole Body Listening Larry! 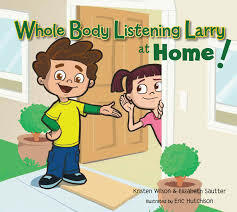 The books, Whole Body Listening Larry at School, and Whole Body Listening Larry at Home, have become invaluable resources for my new venture at school this year. Authors, Kristen Wilson MS-CCC, and Elizabeth Sautter MA-CCC have provided educators an engaging children’s storybook that teaches learners that “listening” is more than just hearing with your ears. 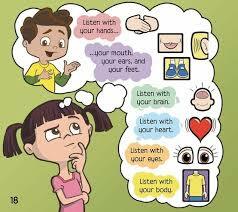 Listening is a holistic process – engaging multiple senses and self-regulating behaviors to help focus your brain and body to be engaged in learning. These books are fittingly published by Think Social Publishing, Inc – (https://www.socialthinking.com/books-products/products-by-age-range/preschool/whole-body-listening-larry-at-school-detail) – these books align perfectly with the goal of teaching early childhood and young elementary age learners about all the components and social behaviors of good listening skills. This year, I have been thinking about how I can bring some of my social skill resources and lessons into general education classrooms. At my elementary building, we are continuing to reflect and adjust our teaching based on student data and growth – all the while using an Rti framework, implementing proactive positive behavior practices school-wide, and aligning instruction to the Common Core. This year, I have committed to trying to weave some of my social/emotional strategies into 1st, 2nd and 3rd grade general education classrooms. I am calling my efforts, “Tier 1 – Collaborative Learning Lessons.“ “Tier 1” = core instruction for all. “Collaborative learning” = over the past few years, I have personally noted classroom activities are much more constructivist, interactive, and utilize social communication skills more than ever. My intention this year is to go into each 1st/2nd/3rd grade classroom once per month and lead the students and teacher through a lesson that promotes positive social interaction necessary for learning in small groups and in the collaborative manner we are moving toward in education. Stay tuned… I will take you on this journey and see how it pans out. I look forward to adding this resource to my primary classrooms! Check out this poster available from Think Social Publishing as well!